This set of hand wrought brass and iron utensils and their wall hanger are a wonderful addition to your kitchen or fireplace surround. The group, as so often happens in kitchens that have collected equipment over a long period of time, is a "marriage," meaning the pieces were made by different metal craftsmen and probably acquired at different times. The 6 inch tall iron wall hanger features a bar with upcurved rattail ends, a diamond shaped back and a round top with a diamond cutout to hang on a nail on the wall. The maker's incised mark is on the back, the conjoined initials JF, with an arrow tail on the J. One of the utensils is a wonderful iron spatula, 11 inches long and 2 inches wide at the bottom, whose handle ends at the top with a heart shape and has a heart cut out of the part that turns your hotcakes. There are lovely designs engraved down the handle and around the open heart. It's incised on the back with the maker's mark T. Loose and the number 77. The other two utensils are ladles with iron handles and brass bowls. The shorter one, about 10 1/4 inches long with a 2 1/4 inch diameter bowl, also has incised designs down the handle; the bowl is attached to the handle with copper rivets. It's also signed by T. Loose but without any numbers. The largest utensil, the other ladle, is 13 1/2 inches long and has a 2 3/4 inch diameter bowl that's attached with iron rivets. This one is unsigned by the maker and has no etched designs. The very top of each utensil curls under on the back to a handsome hook that allows it to be hung on the bar. This set including the hanger is in very good condition, with only the larger of the ladles having some discoloration and corrosion on the handle. We haven't polished them but have left them in their as-found state. The entire set weighs just under a pound, so it's not too weighty for most walls. 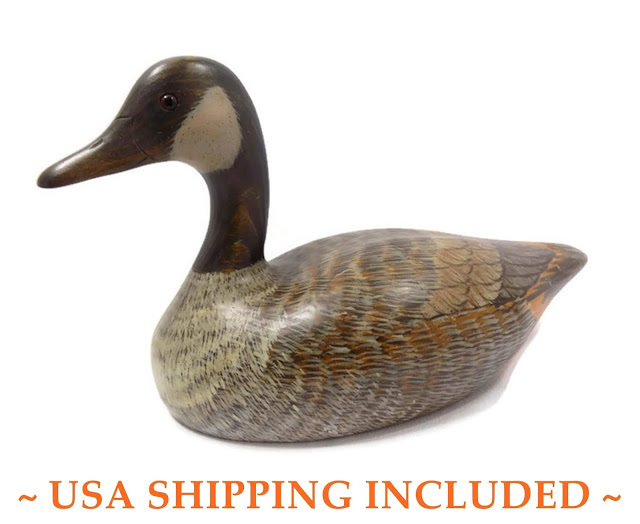 This vase is undoubtedly one of the more unusual studio pottery pieces we've ever offered. The potter, Ron Krogh, was a ceramics instructor in Bountiful, Utah, in the late 1960's. A piece of his pottery is in the permanent collection of the American Museum of Ceramic Art in Pomona, California. This heavy stoneware vase is "wrapped" in pottery pages printed from the Ogden, Utah Standard-Examiner dated July 21, 1969. On one side of the vase the headline is "Moon Walk," while on the other side it's "Apollo 11 Landing." Another side recounts "Nixon Flies to Splashdown Site." The rough stoneware itself is glazed on the interior in a greenish gray, while most of the exterior was left unglazed. Every inch of the surface of this vase is different and fascinating. It's signed on the bottom by the artist, who dated the piece 71 beneath his signature. 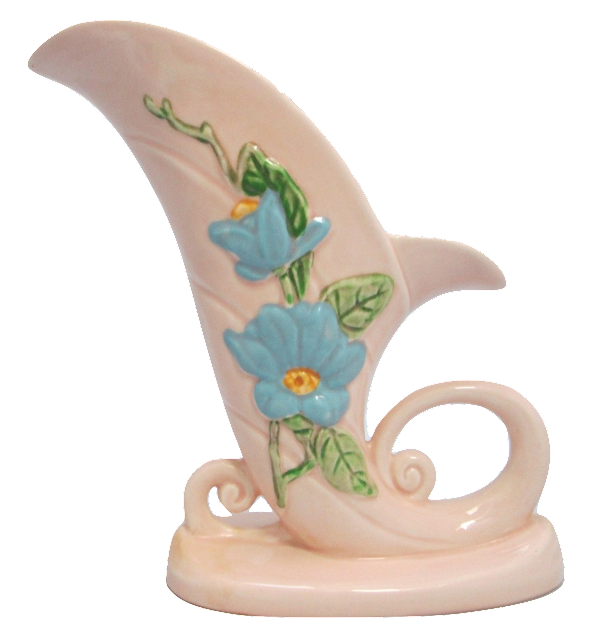 This vase stands 10 1/4 inches tall, is approximately 5 1/2 inches by 6 inches and weighs an impressive 4 pounds, 6 ounces. There is a crack at the top; we believe this occurred during the firing. The protruding bits are all there but there seem to be a few small chips scattered about; given the rough-hewn nature of this vase it's difficult to be sure. Whether you call this brutalist or funky, it's definitely a distinctive work by an expert potter, a work of art to be treasured. 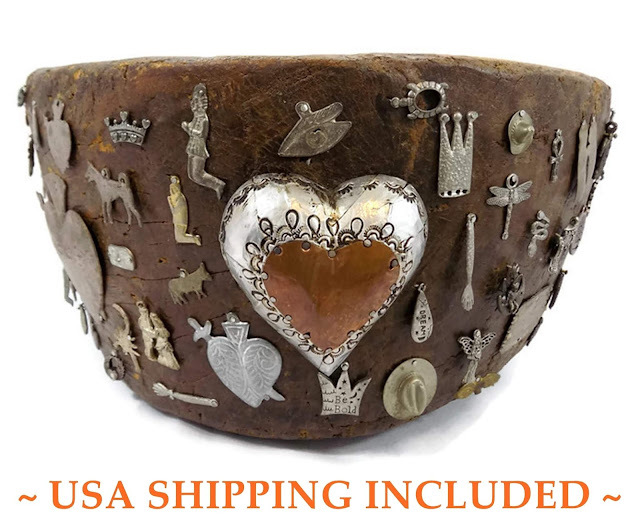 This rare example of a memory vessel is a massive primitive wooden bowl covered with over 100 fascinating mementos. The bowl was hand hewn from a solid log; it's darkened with age and still bears the rough tool marks on the inside. The exterior of the bowl has hand hammered tin and copper objects, both large and small, attached with tiny nails. Many of the items are milagros, Mexican religious amulets used to beseech favors and give thanks. Unlike memory jugs or jars, which are covered with putty or plaster and then completely encrusted with trinkets, the adornments on this vessel were carefully spaced to achieve an artful balance. Anchored by the spectacular tin heart with a copper center, a sampling of the varied range of symbols includes: A cowboy hat, coiled snake, and a couple of scorpions; lots of crosses, large and tiny; several crowns and the Vitruvian Man; parts of the body such as an arm and a leg; an ankh and a peace symbol. Memory vessels like this began in the South as memorials for loved ones. Given the presence of the milagros, we believe this bowl was made in the southwest in the 1800's and then decorated as a memorial at a later date. Most of the memory jugs we've seen (and sold) were decorated with jewelry, coins, mirrors and other personal effects. The strong religious theme of the mementos on this bowl suggest an origin in a southwest town bordering Mexico, probably in Texas. The bowl itself is 14 inches wide across the top and 10 inches across the bottom. 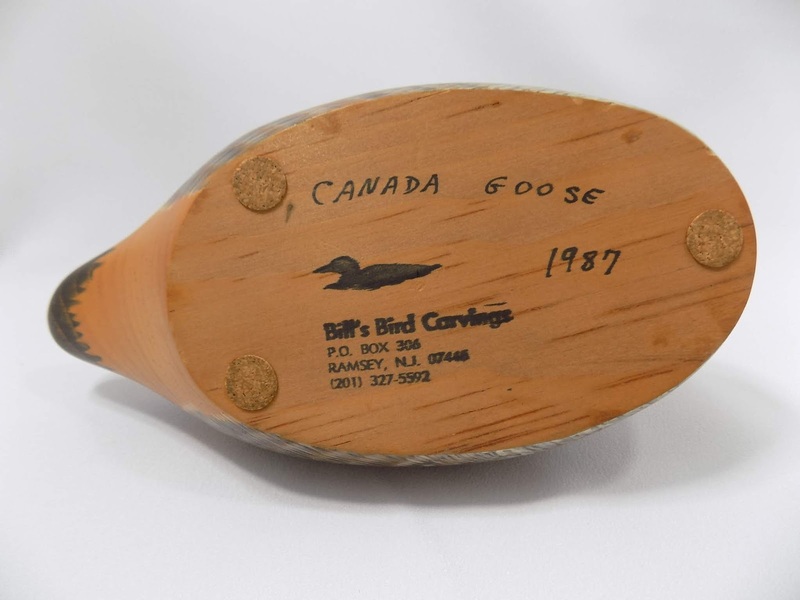 It has a thick rim over 1 inch wide and tapers inside to a 4 1/2 inch diameter bottom. It stands 8 inches tall and weighs an amazing 11 1/2 pounds. 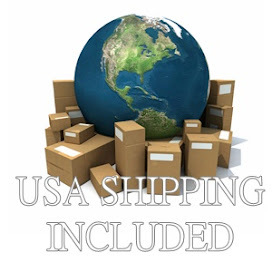 The bowl has several narrow age cracks, which do not affect its sturdiness. The trinkets are all in very good condition, with only eight empty nails. Four round white foam pads were attached to the bottom at some point to protect surfaces; they could be easily removed if you wish. Folk art pieces like this memory bowl are rare and obviously unique. It's a 3-D scrapbook, the symbolism endlessly fascinating, the vessel itself a remembrance of a time, a place and a life. This is a children's alphabet plate, meant to serve a child’s food while teaching the alphabet. These plates were popular in the late 19th and early 20th centuries and have been collected ever since. This one is decorated with a pair of kewpies, designed by illustrator Rose O'Neill, which were initially printed as comic strip characters in the Ladies' Home Journal. As a cartoon described them "Kewpie Elves are Happy Spirits Neither Boy or Girl." Kewpies went on to be made as bisque dolls in Germany beginning in 1912. 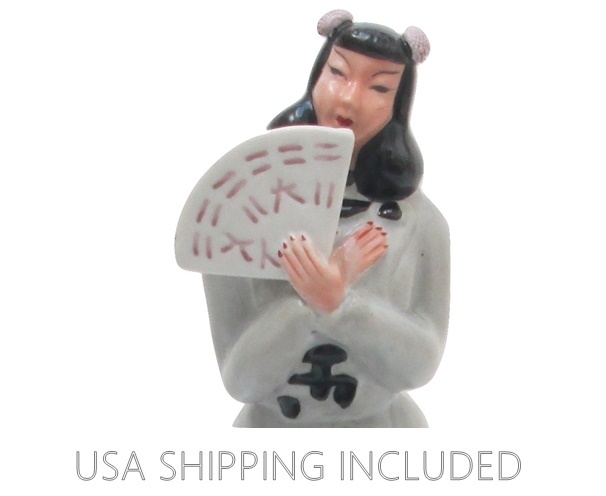 They also appeared as paper dolls, postcards, prints, and many other items, including china and porcelain, like this one. (The black and white photograph is of Rose O'Neill, of course). 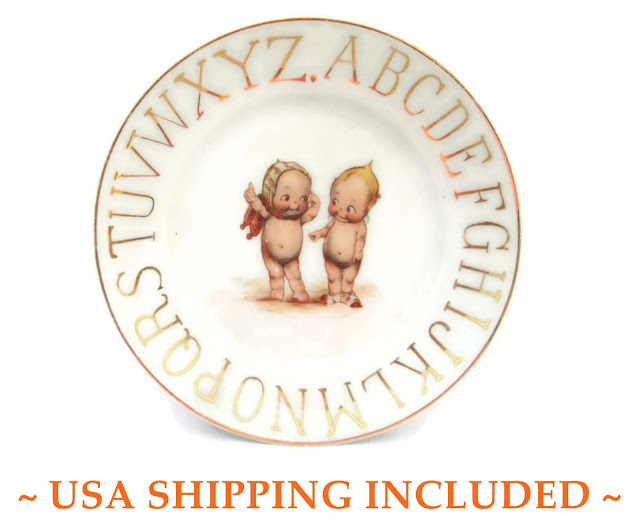 Two kewpies, one with a knitted scarf and cap and the other with just knitted socks, are centered on the pure white porcelain and surrounded with the letters of the alphabet, printed in gilt block capitals around the rim of the 6 inch plate. On the reverse is Rose O'Neill's very distinctive signature, the word Kewpie and the word Germany, all in underglaze green script. It was possibly made by Royal Rudolstadt in Prussia and just missed its manufacturer's logo mark. Given that the kewpies were first published in 1909 and items were required to be marked "Made in..." starting in 1921, we're comfortable dating this plate between 1909 and 1921. It's in absolutely pristine condition, including the gilding, and a joy to the collector of ABC plates and/or kewpies.